Our Organic Chocolate Frosted Diaper Pound cake is 1 a Tier Diaper Cake made with approximately 30 Eco Friendly Seventh Generation Diapers (Size 1) and 1 trial size Weleda Calendula Baby Cream. Elegant and attractive,this Pound Cake is decorated with a beautiful, handcrafted Pink Silk Rose Hair Clip and high end ribbon. 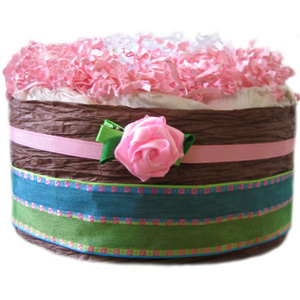 GrowInStyle Pound Cakes look astonishing on their own or when accompanied by our organic diaper cupcakes.